While power is off, the oil pressure sensor (resistive type) reads approx, 250ohms at 0 psi, and 20ohms at 100psi. However when i turn the key on, and the mtx-d gauge activates, resistance measured goes to 0.8Mohms, and if i measure voltage it is at 0.037V. When i start the engine at 55psi, ohms is about 200ohm, and voltage 0.006V. Note that the analog input wire is still connected on these measurements but the channels is turned off, so i don't know if it makes a difference. I'll do more reverse engineering now, but any help is really appreciated! So i reversed engineered both sensors, temp is an NTC, and pressure sensor is 260ohm-35ohms (0-100psi). Both signal lines have about 3.6V pull up and probably an internal shunt resistor to measure the current and therefore the resistance of the sensor. The temperature one should logically work connected to an analog input channel and not an analog temperature channel since the signal is already pulled up. However shouldn't be normally pulled up to 5V? I'll try with PCLink and see if i can measure it normally. Btw all measurements where done disconnected completely while using precision trim resistors to feed dummy resistance values to the mtx-d gauge to see the readings (aka their calibration). So I tested it and it will not work Technically it can be made to work by connecting an external pull up resistor to 5V when connecting the Link ecu directly to the sensors, but i'm not sure what will be the effect if both 5V and Mtx-D pull-ups are connected to the same signal line. 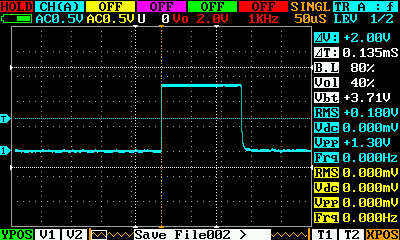 This is due to the voltage difference which would theoretically back feed into the MTX-D unit. I don't know what pull-up resistor they use internally so I'm not sure how risky it will be. Maybe I can measure it. Theoretically I could start using a very high ohms pull-up resistor to limit the current and test it out. But can anyone recommend? Another way to read the values is connecting it via their serial output if Link can implement their SDK, since they use a proprietary protocol. Yes it is definitely not a grounding issue. I did some more research, and while it is not mentioned specifically in the help file, in order to use any type of resistive sensor connected to an AN Volt channel, you will need to add an external pull-up (partially mentioned) specifically 1K (not exactly mentioned), with the exception of the AN Temp 1+2 channels where you can either use the internal pull up or have an external one of specific values which you can select in PcLink. Please see my diagram below. If you exclude the blue circled section (mtx-d) to the right, then the Link ecu should be able to measure the sensors just fine. If you exclude the left circled blue section (link ecu) then the mtx-d gauge can read the sensors just fine. 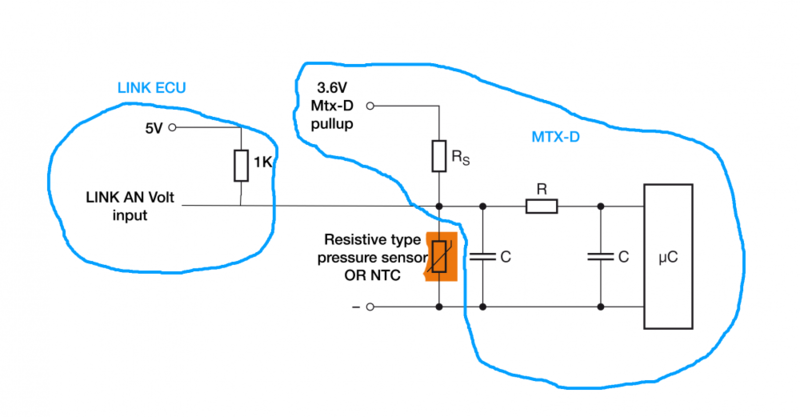 The problem here is that, when measuring a resistive type sensor you are actually measuring the current flow through the sensor and a fixed internal resistor of known value connected to it in parallel. This allows you to do a simple calculation to calculate the resistance value of the sensor and therefore the value of whatever it is measuring. However since the pull-up voltage expected by the Link ECU is 5V, if you connected the signal wire of the sensor directly to an AN volt channel directly (what I did - aka without the 5V pull up in the diagram and the 1K resistor), there is a lower current flow than what it should be, therefore measuring wrong values. And I can't just connect a 5V pull up there as pictured because if I do, 1) there will be current flow back to the 3.6V pull-up line, and 2) if (1) wasn't an issue or things blow up, the mtx-d gauge would read wrong. So i'm kinda stuck here. Ahhhh.... I see. Yes this is correct. You should be able to use a cal table and do the math adjusting the OHM's to get the sensor to read properly. Tnf, both these sensors should work fine spliced directly to link AN volt input without any extra pull-up. The fact that the gauge uses a pull up to 3.6v does not matter you will just not be taking advantage of the full 5v resolution. this type of connection is done all the time for sharing gauges and piggy back ecu installs. I have actually tried this way initially and it didn't work. It seems the ADC is pretty limited, thus you have an upper limit in the ohms cal table (about 65000 ohm), but like i mentioned above when the mtx-d is connected to the sensor, if i measure the resistance across it comes out to a very high ohms value outside the range of what i can calibrate (0.8 Mohms in a particular case), similar to if i measure voltage of the signal line (0.037V in the same case). Also i am speculating how the mtx-d measures the sensors, it might have a constant current source from what we do not know. Also 3.6V is a weird pull-up voltage, this thing is not powered by a lithium battery (3.7V which is near to this value), it should have a micro-controller running at either 3.3V or 5V. Are you actually 100% sure of this? Because like i said if you read my tries above it didn't work. Also it doesn't make much sense from a calculation base of view. This is because you are actually measuring the current to determine the ohms value since fixed pull-up voltage; higher pull-up voltage = higher current through the sensor and vise-versa. I know it works on piggyback situations because most sensors are pulled up to 5V from factory either way. This is not the case here however. Maybe someone from Link can shed some light on this! You should be able to share the signal no problem. You can feed the signal to an AN volt channel for the pressure and a temp channel with pullup turned off for the temp input. You can then do a calibration based off voltage. Simply measuring the voltage in Vs the gauge reading. Using Cal 1-3 and having the input set as volts and out put as temp/pressure. That's correct but apparently something ELSE is going on in this case. Normally you have the pull up voltage resistor in series with the variable resistance sensor so that you essentially get a voltage divider. But if you seen the measurements I posted above, the voltage measured between the signal line and ground, is very very small (0.0XX V) at all times (aka even when the sensor changes resistance value), essentially showing as short to ground (0V) to the link ecu. Thus something else must being going on. I spoke with my cousin which is an electronic engineer, and assuming innovate tried to keep the cost down, is that they probably used a very cheap microcontroller for the gauge, and then used a single 1 channel precision ADC that is switched between the 2 sensors. However this doesn't still make much sense if the pull-up line is fixed, but let's say they didn't have enough current capability so they switch the pull up line between the 2 sensors? This will explain why the multimeter measures 3.6V pull up voltage, due to averaging. Hopefully I have a portable oscilloscope so I will check if this is the case, because everything is weird in this system. Ok i was right! The mtx-d pulls the sensors line high everytime it wants to take a measurement! And it does this alternatively between each sensor, confirming it uses a single ADC (probably). I had a screenshot of both sensor lines connected to my oscilloscope and they were exactly half apart (i lost my screenshot but take my word for it). Frequency of the measurements was about 12.5hz. So every 80ms it takes a measurement from one sensor, aka 40ms between each sensor. So let's say at 0ms it takes a temp reading, at 40ms it will take a pressure reading, then at 80ms a new temp reading, and then at 120ms a new pressure reading! So what do you think should i do next? I would say if its doing that you are out of luck in sharing the signals. You will have to pick ECU or gauges. It is doing that! I need to do some more measurements to verify exactly what it is going on, but i have potential solutions for this problem. - The simplest one is that if it does indeed a voltage measurement (aka voltage divider) when it pulls up the line, then i can technically pull up the line to the same voltage continuously so that Link can take measurements as well. 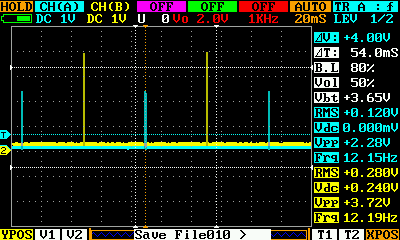 Of course from what i've seen the pull-up voltage is much lower than 5V, but i need to check that using DC coupling. I will need to play with the pull up resistor though in this case since i need to much the effective resistance to the internal value since the extra one will be connected in parallel. I'm not 100% sure that this will work though. - The other solution is to put an arduino (atmel) microcontroller that will take measurements when mtx-d is not taking measurements and then output them in 0-5V analog voltage to the LINK ecu. This will 100% work for sure. Serial is not an option unless the device can work with our PClink protocol. This can not be changed as it is what PC link uses for all its communication. Yep. If it was me I think I would be fitting a couple of extra senders to run the ECU.